Becky had a speaking engagement to the graduating internship class at Yale-New Haven hospital scheduled for the end of August. Because Hugh had never been to Boston and Becky was in the area, we decided this would be a good time for a weekend tour. Robin and Steve don’t need an excuse to go to Boston…it’s only a 3 hour cruise up the Mass turnpike to the city where they met (not to mention a good excuse for the first road trip in the new Prius). 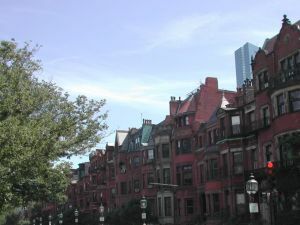 As soon as we decided to meet in Boston, Robin was on the internet searching for the perfect location for us stay; she booked into the Newberry House B&B which was conveniently located in the Back Bay Area. Next she started planning venues to visit and restaurants to try. Hugh flew from Calgary to Boston via Toronto on the midnight flight and arrived in Boston mid morning and then took the subway to the Newberry House. Robin and Steve met Becky in New Haven and drove in the new Prius, arriving around noon. We had a few minutes to enjoy some nosh on a park bench on the esplanade on Commonwealth Boulevard before walking to the orange line for the subway ride to the Sam Adams brewery. We arrived in time for the 2:00pm tour and met Bill and Kathy who had driven in from Attleboro. The tour was very informative even though it was designed for tourist. 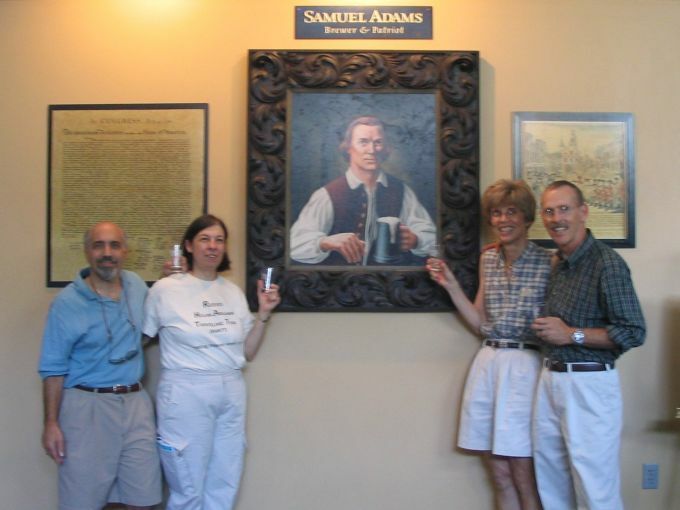 We did learn that Sam Adams beer is made according to the German Rheinheitsgebot which means it contains only 2 row barley malt, imported hops, yeast and water. There are no adjuncts in their beers. The tasting following the tour was a little disappointing; the signature beer Sam Adams lager was good, but the other two selections…Summer Pale and Cherry Summer Ale were not appealing to my palate. Bill, Kathy and Robin returned to the B&B in Bill’s new Acura (with directions provided by Maggie, the nav system); Hugh, Becky and Steve returned on the Orange Line subway. They stopped at a corner deli to get supplies for the afternoon happy hour. Soon it was time to start the evening hike to the Nightingale Restaurant in the South End. The meals were all quite good; we made our wine selection, a red table wine from the Langedoc, to commemorate the barge tour. That turned out to be a poor reason for selecting the wine. At least we came up with a memorable quote, “The only advantage of a bad bottle of wine is that it lasts the entire meal”. We returned to the B&B by a more direct route where we enjoyed the traditional after dinner single malt and chocolates. Bill and Kathy then drove home to Attleboro and we turned in for the night. We started with the Continental breakfast and then conferenced to make plans for the upcoming tour to Morocco and Amsterdam. Robin had a folder full of maps and travel information. Soon we had a pretty good idea of how we were going to tour Morocco and everyone got assignments to help finalize the plans. We walked to Copley station where we caught the Green Line to Park Street and changed to the Red Line for Cambridge. 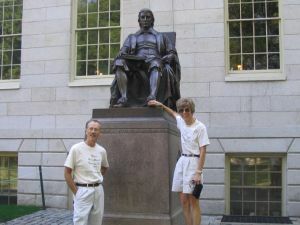 There we toured the Harvard Undergraduate Campus and learned the three lies of the John Harvard statue: 1) John Harvard is not the founder of Harvard, 2) the date on the base is incorrect and 3) the figure is not John Harvard, but some student. We returned on the Red Line to the Boston Common to begin our walking tour of the Freedom trail. First stop was the Granary Burying Grounds where we happened into excellent explanations of the graves of Mother Goose, Paul Revere and Sam Adams. 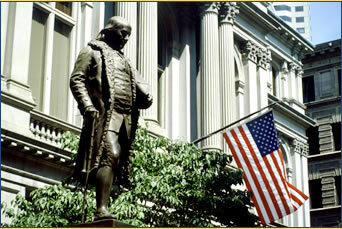 The next stops were King’s Chapel, Ben Franklin’s Statue, Site of the first public school and the Old State House. It was just outside the doors that the Boston Massacre unfolded in 1770, and from the balcony that the Declaration was first read to the people of Boston in 1776. Now, Old State is the oldest surviving public building in Boston, housing as a museum of Boston history operated by the Bostonian Society. We continued on to Faneuil Hall and Quincy market where we decided it was time for a break. We discovered the Bell in Hand Tavern which is the oldest pub in Boston and sampled some Harpoon IPA. We walked on to the North End crossing the site of the old elevated central artery. When completed, the old elevated expressway will be replaced with parks and green spaces. Next stop was Paul Revere’s house where we enjoyed the tour because of the excellent docents. We learned that Revere was an accomplished silver and goldsmith, but Hugh was convinced that he had fashioned pewter beer mugs and determined to find a replica souvenir during the rest of the tour. Probably the imagination is much more vivid than reality, because we never found a mug to match the requirements. We visited the Old North Church next where a tour guide gave an excellent explanation of Paul Revere’s famous ride. At this point we left the freedom trail walking through Copp’s Hill Burying Ground to the harbor and a view of Old Ironsides. At Government Center, the old Sculley Square Station, (Charlie's wife goes down to the Sculley Square Station every day at quarter past two, And through the open window she hands Charlie a sandwich as the train comes rumbling through) we caught the Green Line back to Copley and walked back to the B&B stopping at the corner deli for sandwiches. 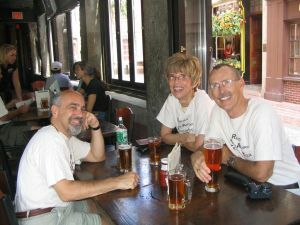 We had a couple of hours before we had to leave for Fenway Park for a game between the Red Sox and the Detroit Tigers. Robin and Steve went to visit their godson Howie who is the son of Esther and Arthur (who introduced Robin and Steve for the first time). Fenway Park is a 25 minute walk from the Newberry House. The crowd control entering and exiting the park should be reviewed and improved; the pinch points really do slow the pedestrian traffic. The first construction of Fenway was 1912; there have been many renovations since, but the playing field remains virtually unchanged. Our seats (compliments of Esther and Arthur) were located behind the first base dugout. It was an entertaining game with lots of hitting (including a grand slam home run), runs and great defensive plays. The pitching was dismal and Boston eventually lost the game 12-8 after jumping to 6-0 lead in the fourth. We walked back to the B&B and crashed for the evening. After a late breakfast at the Newberry House, we checked out and packed into the new Prius for a 40 minute drive to Salem. 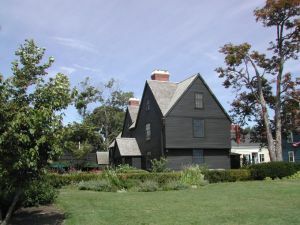 We were looking for the House of Seven Gables which we eventually found, no thanks to the flawed directions on the travel brochure. We first toured the birth place home of Nathaniel Hawthorne, then took the guided tour of the historic seven gabled house. From there, we drove to the Salem Witches Museum for a tour and presentation of the witch hysteria which lasted for three months in 1692. The “downtown” area has been redeveloped into a tourist attraction with streets converted into pedestrian malls lined with shops designed to appeal to visitors, although none had enough appeal to draw us in. After a walk around the town and an ice cream cone, returned to the car and drove the old highway 1A to Logan airport for our flights home. Robin and Steve stopped to visit Herb and Ruth in Framingham on the way back to Westchester county. They encountered some traffic congestion which added about 50% to the normal driving time.